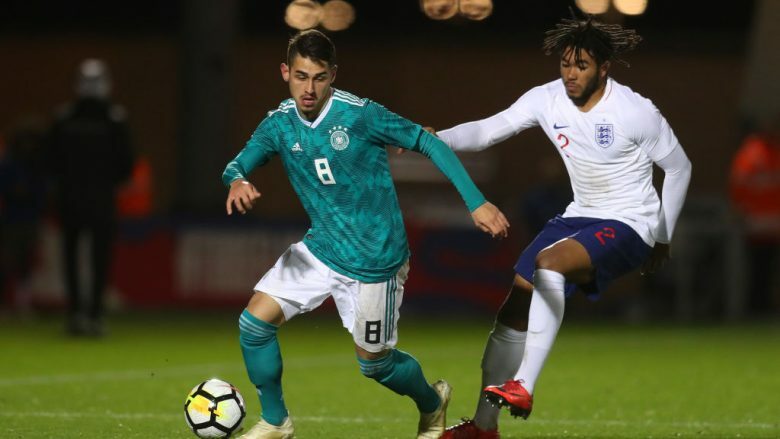 The Dutch side has reportedly targeted Bayern Munich youngster Meritan Shabani as a replacement for the Barcelona bound Frenkie De Jong. De Jong completed a £65m move to Barcelona this past week writes Will Godley. German newspaper Bild have reported that Shabani is seen by the Dutch club as De Jong’s successor. Shabani is a Munich-native, having joined Bayern when he was seven years old. He is currently contracted to the club until 2020 and trained with the first-team in Doha during the German winter break. The 19-year old is seen as one of the most promising youth prospects at Bayern Munich and has made three first-team appearances. However, with so many talented midfielders currently at Bayern, opportunities will be hard to come by for Shabani unless he moves away. Ajax appears to be very interested in the player and should now step up their interest, after the sale of De Jong earlier this week. The Eredivisie side is keen to integrate Shabani into head coach Erik ten Hag’s team during the second half of the season and hope to make a deal before the January window closes. Bayern may consider inserting a buy-back clause or a first-option clause into the player’s contract, should he leave the Allianz Arena. It is no secret that Bayern is interested in Ajax’s 19-year old centre-back, Matthijs de Ligt. With that mind, they may also consider giving Ajax favourable terms in the Shabani deal to get an upper hand in future negotiations for De Ligt. Any advantage would be favourable, considering the size of the club’s competing alongside them for the signature of the Dutch youngster. Shabani is most comfortable in an advanced midfield role. His skill set has allowed him to move further forward during his career and he is capable of playing on either wing. However, he is more confident operating centrally. He was promoted to the Bayern U19 squad at the age of 16. Shabani’s rapid rise continued from there, moving up to the Bayern II team, before earning a first-team call-up. Jupp Heynckes gave the youngster his first-team debut in the Bundesliga against Eintracht Frankfurt last season, after Bayern had already won the league title. Since then, his confidence has grown. He featured prominently in the club’s pre-season tour of the US and made another Bundesliga appearance against Frankfurt this season. He has also appeared in the DFB Pokal. Shabani is a dual national, who is eligible to represent Germany and Kosovo at international level. Although, Germany appears to be winning the race for his services. He is currently an U20 international for the Germans. The midfielder’s statistics are very impressive. For the Bayern U19 side, Shabani scored 15 goals and made 12 assists in 69 appearances. For the Bayern II team, he has scored 9 goals and made 4 assists in 19 appearances – including 3 goals in 4 UEFA Youth League games. Shabani has good ball control and likes to run at defenders. That, combined with his impressive goals tally, makes him a real attacking threat. Click here to follow Will on Twitter. ← Doelman Dilemma: Who will succeed Andre Onana as Ajax number 1?